Finally, am so happy to have found this new place fresh meats nearby my home and my search for a good place with good quality meat with great hygiene ends here. This might seem like a simple thing but I've been facing enough for the last one year, cos I din't find anything better to feed my son and all thanks to one of my friend here in my apartment, she only recommended this shop to me. The meat was fresh, that it has taken only 10 minutes to cook altogether. Now u may see many more mutton recipes in future, so watch out guys. 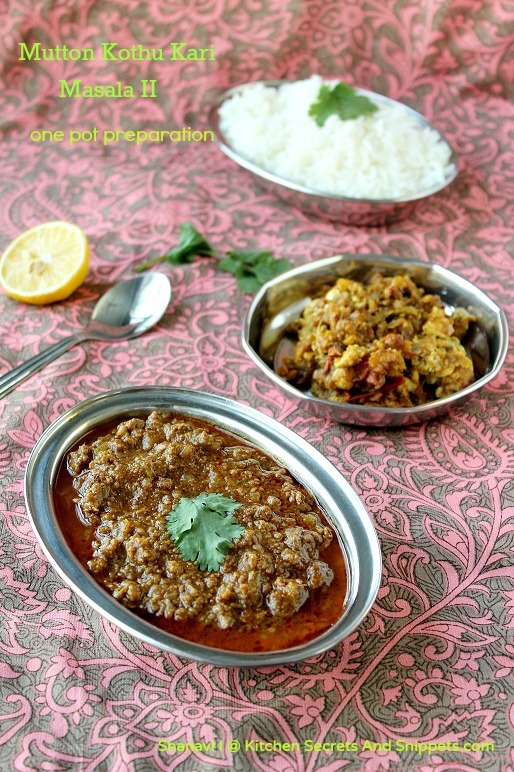 I've already posted one Mutton Kheema Masala recipe check it out .. In this new preparation, the masala which is to be shallow fried gives the dish a great punch and it is full of flavor..Try this method once and let me know ur opinion. Heat a pan with 1/2 tsp of oil and fry the cinnamon stick, cloves, cardamom, whole pepper, fennel seeds, shahi jeera, ginger, garlic one by one until all the spices are fried. Let it cool and grind to a fine paste. Add 2 tbsp of oil in the pressure cooker pan and fry the finely chopped onions until it sweats. Add the ground masala paste ( 2 tbsp of paste) to the onion and saute well for a minute. Now add the turmeric powder, red chilli powder, coriander powder, salt and fry the masala so that the raw smell of the spices go away. Keep on stirring the masala until it turns try like in the pic. Dump in the minced mutton and mix with the masala. 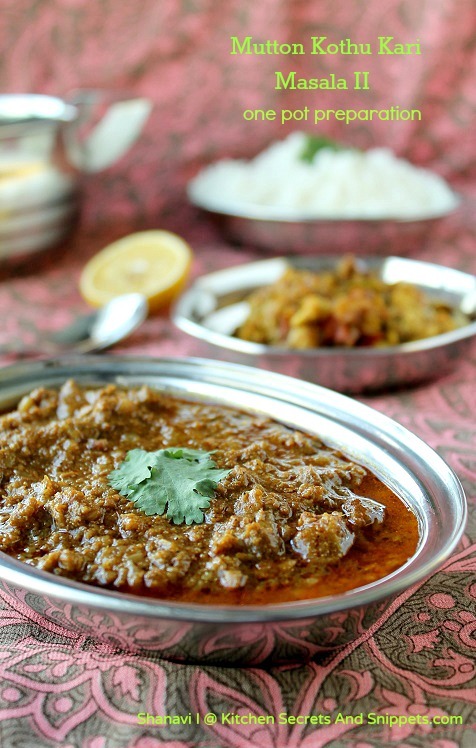 Thoroughly blend the minced mutton with the masala. Add in the curry leaves, coriander leaves and stir together. Saute well for 2 to 3 minutes without adding water. Add in 1/4 cup of water to the masala and combine well. Close the pressure cooker with the lid and pressure cook for 10 minutes. Keep the flame on high until the first whistle comes, turn down the heat and cook the kothu kari masala for the remaining time or until the mutton is cooked. Wait till the pressure gets released, open the cooker, mix well. Add the lemon juice, if using, and combine once again and serve with rice /roti's. This time the mutton I used was good, 10 minutes was enough to cook it through. Kindly adjust the timings acc to the quality of meat and cook accordingly. 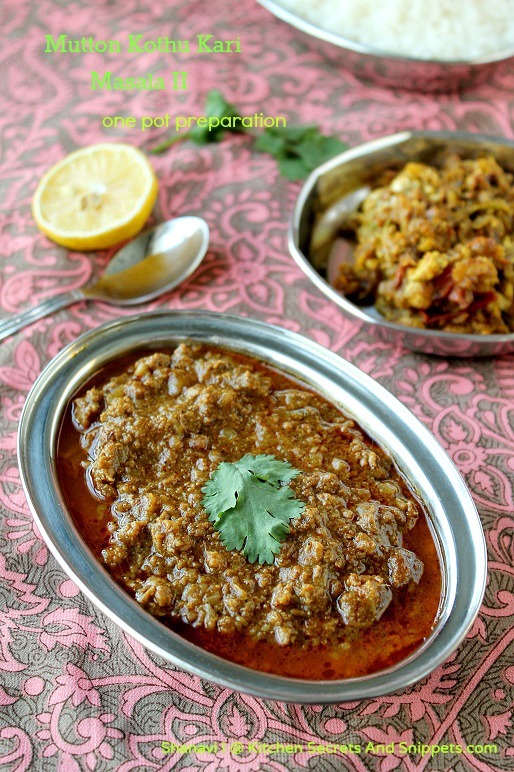 The ground masala paste may yield more but only 2 tbsp is needed to make this kothu kari masala. Do not add too much of water , 1/4 cup is enough for this amount of mutton. Do not forget to turn down the flame after the first whistle comes, else the dish would get burnt as it has only 1/4 cup of water. Else u may keep the masala in a seperate vessel, put inside the pressure cooker and cook for the specified time. shanavi never seen kothu kari this stunning,looks so tempting. Am drooling over here sho ..am inviting myself to ur place to enjoy this curry with roti..
simply awesome preparation shobhana.. like the way it has come..
Goodness, that looks so gorgeous. 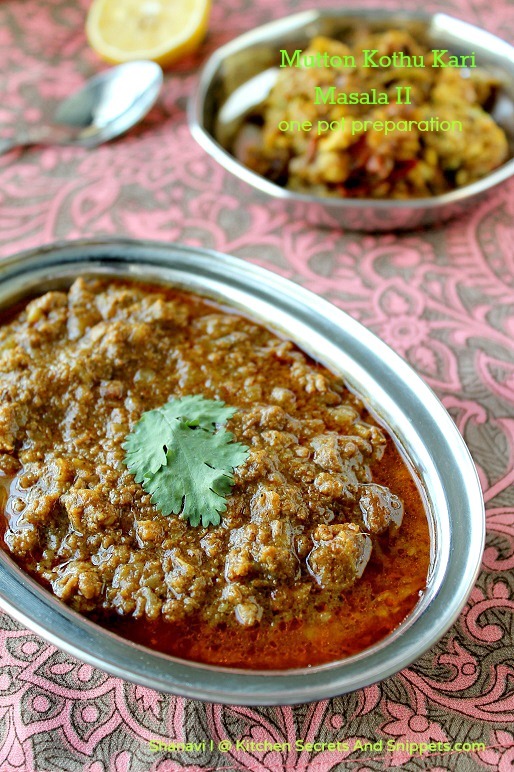 Haven't made mutton kheema in a long time, must try this recipe soon. Delicious and tempting dear. Thanks for sharing. Can really imagine the taste just by seeing the pic! lovely recipe sho.. Such a droolworthy and fingerlicking kothu kari masala, cant ask more..
Looks super tempting,perfect with rice and rotis..
thanks for sharing the delicious mutton recipe with us, i am fond of mutton cuisines and your recipe helped me a lot to try different taste of mutton.